Don’t. This is when it can get really fun. Starting 0-2 or even 1-1 can be a letdown but remember it’s early, so trust what you’re doing. Last year in a Yahoo! league my fantasy team started 0-2 and I was 1-3 after four weeks. Obviously it’s no fun to start like that but I never lost confidence. Why? Because my team was literally outscoring everyone else; even in losing efforts. I’m a numbers guy, so I liked my odds that a team with Aaron Rodgers, Antonio Brown, Odell Beckham, Jr., Emmanuel Sanders, and Matt Forte wouldn’t have 16 consecutive weeks of bad luck no matter how bad my start was. I was right, finishing 11-1 (including playoffs) the rest of the way. I can’t believe I’m saying it, but I’m buying a Patriots running back. We’ve all been there before, right? 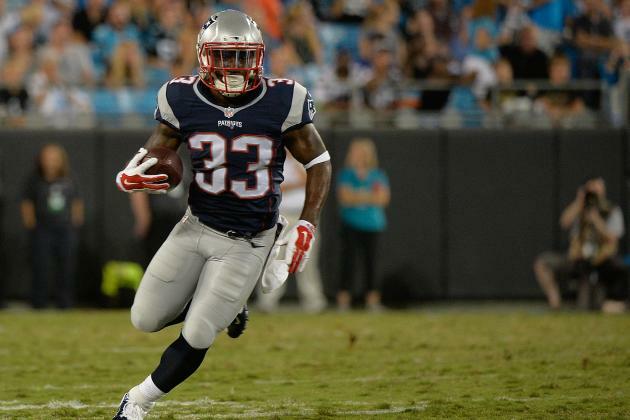 Brandon Bolden, James White, LeGarrette Blount, Corey Dillon, Jonas Gray, Steven Ridley, and on and on; yet here we are again enticed by two solid weeks of Dion Lewis’ production. I have to say, part of that production comes from Tom Brady’s unlikely renaissance as Fantasy Football’s top quarterback option through the season’s first two weeks. Another week another touchdown. That’s what Karlos Williams does in Buffalo. Not only is Williams averaging 6.3 yards per carry (for perspective, McCoy is averaging 4.1 YPC and hasn’t scored on the ground yet), he’s also starting to show some potential in the passing game (two catches, 16 yards against New England last week). Rex Ryan and the coaching staff liked him a lot coming out of camp and they’re proving that with every opportunity they give him. If you haven’t hopped on the bandwagon yet it might be too late. Now it’s getting ridiculous with these two. I never predicted the demise of Antonio Brown or Rob Gronkowski, but I am guilty of understating their value. If you own either (or both) then you know that each individually has won a matchup for you, together they might have buried whoever you were playing. Normally on this site I try to uncover the guys you might not hear too much about, but I had to take a moment and recognize the insane production Gronk and Brown have given Fantasy owners the last two seasons. I heard a collective sigh of relief from fantasy owners this week. A lot of that had to do with Odell Beckham, Jr. confirming our belief in his skills. OBJ went off for seven catches (12 targets) for 145 yards and a touchdown. After a week 1 that had everyone wondering if he’d be the 2015 version of Keenan Allen, OBJ showed why we all bought in the first place. Week 3 has him matched up against the Redskins so he should be able to keep that train moving in the right direction. All that talk about the Eagles’ offense during the offseason and it has been nothing more than that. Sam Bradford has been a dud and Demarco Murray doesn’t have the benefit of Dallas’ offensive line. Jordan Matthews has value, but one has to wonder how long that will last if Bradford continues to struggle and defenses begin to take him out of games altogether. For all the hype surrounding Kelly and this offense they haven’t been able to get anything going on the ground, and if Bradford doesn’t find his accuracy on the deep ball it might be time to start looking for other options outside of Philadelphia at Quarterback and Running Back.